The Rainbow Tower is a 50.3 metres (165 ft) tower located at the Rainbow Plaza Canada–US border station of the Rainbow Bridge in Niagara Falls, Ontario, Canada. Construction on the tower was completed in 1947. 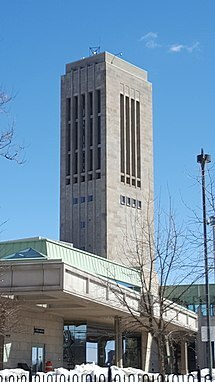 The tower, part of the Canadian plaza of the bridge, was designed by Canadian architect William Lyon Somerville. The Rainbow Tower houses a carillon—a musical instrument consisting of a baton keyboard that controls a series of bells. The Rainbow Carillon is sounded three times a day, 365 days a year. It features 55 bells with a total weight of over 43 tons. The instrument is controlled via a series of 55 oak batons and 30 foot pedals. The largest bell, called a bourdon, is 8 feet (2.4 m) in diameter and 6.5 feet (2.0 m) tall, weighing in at 10 tons. Musically the pitch of this bell is E. The smallest bell in the instrument weighs less than 9 pounds (4.1 kg) and has a circumference of 5.75 inches (146 mm). The bell castings for the Rainbow Carillon were begun in 1941 by John Taylor Bellfounders of Loughborough, England, but interrupted by the onset of World War II. Work on the instrument resumed in 1945 and was completed by 1947. When the tower was built it contained a small apartment for the resident musician (the carilloneur). By the early 2000s, the Niagara Falls Bridge Commission had replaced the resident carilloneur with a fully automated system. The instrument can still be played manually, but is mostly automated to allow for frequent playing. Robert Kleinschmidt, June Somerville, Robert Donnell, and Leland Richardson have served as carillonneurs at the tower. The Rainbow Tower was featured in the 1953 Marilyn Monroe thriller Niagara. Scenes were filmed outside the base of the tower, combined with sound stage footage. Incredibly, the long "tracking" shot of Marilyn Monroe was completed in one shot, unheard of in "Three-Strip" Technicolor. ^ "Somerville, William Lyon". Biographical Dictionary of Architects in Canada 1800–1950. Retrieved August 23, 2017. ^ "Niagara Falls Bridge Commission". niagarafrontier.com. Retrieved 2016-07-30. ^ Speedie, Ann. "Music in Niagara Falls". thecanadianencyclopedia.com. "The bells of Niagara have historic ring; REDISCOVERING NIAGARA". Niagara Falls Review. Retrieved 20 July 2006. This page was last edited on 15 November 2018, at 07:25 (UTC).